The devastating flood of 1997 created the opportunity to undertake a comprehensive redevelopment of Yosemite Lodge, the expansion of Camp 4, and the relocation of Northside Drive. 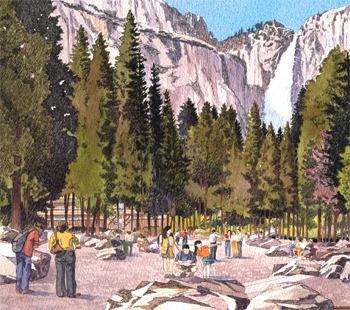 Extensive coordination with the environmental consultant assured a plan that met the spirit and directives of the previously prepared Yosemite Valley Plan and EIS. 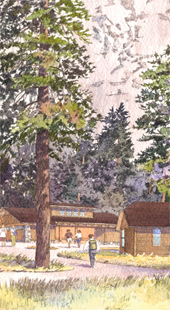 The site design links the outdoor experience more closely to the Lodge by consolidating parking and building footprints with reducing roads, paths, trails, and utilities. The road relocation will eliminate the conflict experienced daily between visitors to Lower Yosemite Falls and vehicles exiting the park. Field surveys of building locations prior to design development assured accuracy and refinements needed to place buildings gently within this world-renowned setting and to maximize view potentials. Restoration and revegetation uses plants propagated exclusively from Yosemite Valley. Site lighting was designed for limited distribution and low levels to minimize light intrusion.